The Bissell ProHeat Pet Advanced Carpet Cleaner 89108 is designed to keep carpets clean and smelling fresh despite having pets in the house. Not only can it clean carpets, it has a hose and handtool attachment for cleaning upholstery. Highlights of this carpet cleaner include a water heater which is built in the cleaner and a pet stain removal tool. This Bissell model is a special Walmart edition machine with wide consumer appeal. Note: This item is currently not available. There is a newer and very similar model. It comes with Heatwave Technology that maintains water temperature, instead of having an internal water heater. It’s the Bissell ProHeat Pet Advanced with HeatWave Technology 1799. Some people prefer cleaners without internal heaters (see why). Alternatively, if you want a model with a heater, check out the Bissell ProHeat 2x Advanced 1383. DirtLifter® PowerBrush – The design of its six-row rotating bristles allows deep-seated dirt to come out of the carpet, but grooms the fibers smoothly at the same time. The brush can be used on various pile heights because of its floating suspension. Built-in Heater – The built-in heater will increase the temperature of the water you put in to 25 °F but will not go over than 180 °F. You can switch off the heater switch if you need to clean delicate carpet fabric. Some customers deliberately seek out cleaners with built-in heaters, while others say that the heating mechanism makes the machine more susceptible to malfunctions (more). Rinse & Other Cleaning Modes – This Bissell ProHeat pet cleaner has a switch near the bottom of the machine that adjusts the level of detergent mixed with the clean water. The water and detergent solution are stored in separate tanks and mixed only during cleaning. There are 3 cleaning modes: Heavy, Normal and Water Rinse. 2-in-1 “Bladder” Water Tank (1 Gallon Capacity) – This cleaner is equipped with Bissell’s 2-in-1 “Bladder” tank system. It has a good capacity (one gallon) to accommodate clean water, which is used to mix with the cleaning agent. After cleaning, collected dirty water is kept in a separate tank from the clean water. Only one tank is carried to be emptied and filled with water. Accessories — The Bissell ProHeat Pet 89108 machine comes packaged with two handtools for cleaning upholstery, spots and pet messes. There is a Deep Reach pet tool and a 3 inch stain tool. Flow Indicator — A spinner that is found on the base of the machine tells the user that the cleaning agent is being applied on the carpet and if the water tank should be refilled. 12 amps – The Bissell ProHeat Pet advanced carpet cleaner has a powerful 12 amps motor. Bissell cleaners with built-in heaters typically have a more powerful motor. Some customers are pleased that pet stains are easily removed, bad odor is eliminated and that it can even clean light-colored carpets. Other customers even say that their carpets (some of these were more than five years old, with lots of foot traffic and pet stains and have never been cleaned) look as good as it was first bought. It is also effective at reclaiming dirty water, which means that it is suctioning out a lot of dirt from the carpets. Customers have found this Bissell 89108 pet carpet cleaner easy to assemble and easy to use. Others are happy that this carpet steam cleaner came with different custom cleaning modes, such as heavy or water rinse. This made the machine easier to operate, as there is no need to empty out and fill a new tank when users desired to rinse out the detergent from their carpets. This is a relatively inexpensive cleaner for the combination of features that it has. With a price tag of usually under $180 (check current price) and having a built-in water heater and handheld scrub tools, it’s a great deal. 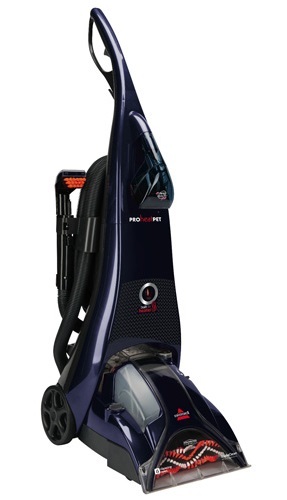 This is a great machine for the price but it’s user ratings are a tad weaker than other Bissell upright cleaners. While there are lots of happy feedback from users, there are also a number of user complaints related to the longevity of the Bissell Proheat Pet 89108 machine and machine malfunctions. One user Christina mentioned that the machine worked very well at first. Then the heater stopped functioning, and next the suction became weaker and weaker. Aside from the user ratings and feedback on machine longevity, this model lacks several features often associated with mid-range Bissell carpet cleaners, such as the Surround Suction feature, Double brush rolls and Edge Brushes. These features are there to improve cleaning performance. If budget allows it, the next two Bissell models up to compare this with are the Bissell DeepClean Premier Pet Carpet Cleaner 17N4 and the Bissell ProHeat 2X Advanced Carpet Cleaner, 1383. The Premier Pet 17N4 has a true Pet Hair basket feature and is popular with pet owners. The Bissell ProHeat 2X does not have the pet hair basket feature (like the Bissell Proheat Pet 89108), but it does contains a built-in water heater along with double brush rolls. The Bissell 89108’s unique appeal is that it is an inexpensive basic machine that comes enhanced with special features like a built-in heater and rinse washing. All for one low unbeatable price tag. Many customers are drawn to this Bissell Proheat Pet 89108 model because of the “pet” label in its name. What makes this a pet model is due to the accompanying Deep Reach Pet Tool accessory that comes included with the package. The deep reach pet tool is a special handheld brush with long bristles equipped to clean out tough pet stains. This tool accessory (retail price of approx. $40) is available as an additional purchase for use with numerous other Bissell upright cleaner models that do not have the “pet” label. Bissell makes other “pet” machines in their Pet Premier and Deluxe lines. These often come equipped with a special Pet Hair Basket feature for catching pet hair and debris. This Bissell Proheat model and does not incorporate the Pet Basket feature. However, it does have a lint cover over the motor duct to stop hair and lint from becoming tangled with the motor. To clarify, this lint cover feature can be found in other “non-pet” Bissell models as well. This Bissell cleaner machine has been specially designed for Walmart’s audience. It is very unlikely that you will find this at other online sites or stores, not even Amazon. Even if you do, it’s not likely to be as cheap as at Walmart.com. Should You Buy The Bissell ProHeat Pet Advanced Carpet Cleaner 89108? The Bissell ProHeat Pet Advanced Carpet Cleaner 89108 is an effective and handy carpet cleaner for people who keep pets. To facilitate enhanced carpet cleaning, this Bissell 89108 cleaner incorporates premium features that you don’t see in a lot of machines, such as having an internal heater and a carpet rinse-mode switch. 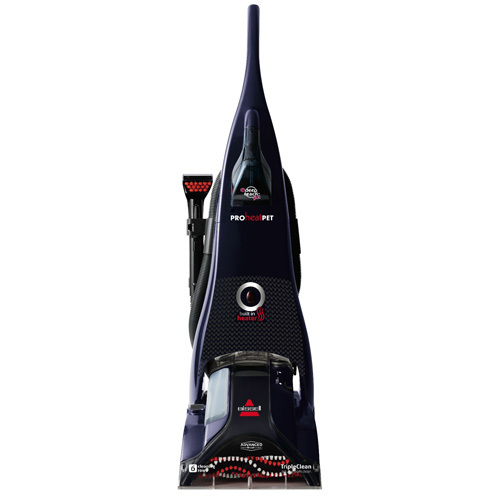 Its superb cleaning ability, user-friendly features and affordable price makes it a unique and practical choice. Not sure if this model is for you? Look through the list of the Top 10 Home Carpet Cleaning Machines, or browse additional Bissell carpet cleaner reviews. You may also want to compare this with the Bissell ProHeat 2X Advanced 1383.